Pros: It can be used wet or dry and it follows the contours of your body, which gets good results. It's comfortable to use with the non-slip design and cordless. Cons: Painful to use, particularly during the first time but thats the same for most epilators, it isnt the best choice for use on the face. No one can deny how painful epilators can be. However, despite the discomfort they give, a lot of people are still willing to give this hair removal device a try. 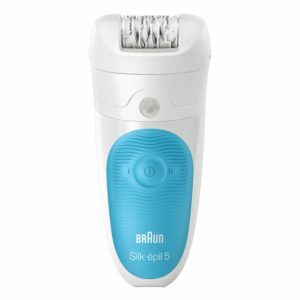 Braun Silk Epil 5-511, although painful, doesn’t disappoint when it comes to results. Using it can give weeks of hair-free skin that’s free of nicks and cuts you can usually get from shaving. It can remove very fine hair whether you’re using it dry or in the shower. With its unique features and design, this epilator is worthy of its price. In case you’re still thinking twice about buying the product, here’s an in-depth review to help you make that final decision. Unlike most epilators that are only capable of gripping thick and long hair strands, the Braun Silk Epil 5-511 Epilator can pull out hair as fine as sand. It can catch hair as small as 0.5mm with its 28 fast spinning tweezers to give you a completely hair-free result. Each epilation can last up to 4 weeks, which means you don’t have to frequently use it just to maintain your smooth skin. One thing that sets this epilator apart from its competitors is its unique design. For one, it comes with a convenient rubbery grip design that will prevent slipping while you’re epilating in the shower. Aside from that, its Skin Contact Cap also makes it easier for you to go through the different contours of your body. You don’t have to risk missing some areas just because you can’t get the epilator to reach them. It’s cordless, too. This features will make it easier for you to maneuver the device without being caught up in tangles of wires. It adds up to its effectiveness and comfort. To get the best result, try to hold the epilator at a 90-degree angle against your skin and the direction of your hair growth. You don’t have to push the epilator deep into your skin to pull out hair. You only need to press it lightly to get it to do its job properly. If dry epilation makes you extremely uncomfortable, then you can take this device in the shower to make hair removal a lot less painful. You have to keep in mind, however, that epilating for the first time can really cause some pain. Once your skin gets used to the discomfort, the succeeding epilating process will become less and less uncomfortable. Aside from its ease of use, it’s also 100% waterproof. You can place it under running water to clean any accumulated hair strands on its tweezers. Although it can be used wet, you should still avoid applying any moisturizer on your legs before using it. This is to ensure that the epilator will not have a hard time gripping your hair strands. For best results, moisturizers should be applied after epilating. The device comes in two speeds, which gives you more space to adjust to the discomfort of using the epilator. Depending on your skin’s tolerance, you can either go for the gentler first pass or the more effective yet painful one. The Braun Silk Epil 5-511 Epilator has a charging time of one hour. Each charge can last you about 40 minutes, which can be enough to do both legs. While some epilators tend to decrease in efficiency as you use up their batteries, this one can sustain its power while you’re using it. The Braun Silk Epil 5-511 Epilator is one of the best epilators around- if you have a high tolerance for pain. This epilator can be uncomfortable to use and is not recommended for first-time users. Although using it in the shower can decrease the pain, a lot of consumers still won’t recommend the product to faint-hearted people. With its non-slip design and ability to pull out very fine hairs, the Braun Silk Epil 5-511 Epilator can be worth your money. It’s easy to maneuver and has a long lasting battery life. It’s expected to give results that can last for 4-weeks. If you’re willing to undergo its painful epilation process to experience this kind of result, you can consider this epilator a good deal.